By now, most of us would be familiar with wireless charging. When Samsung announced its latest flagship smartphone, the Galaxy S4, it came supported by wireless charging, although not out of the box; meaning you have to buy the charging mat separately. 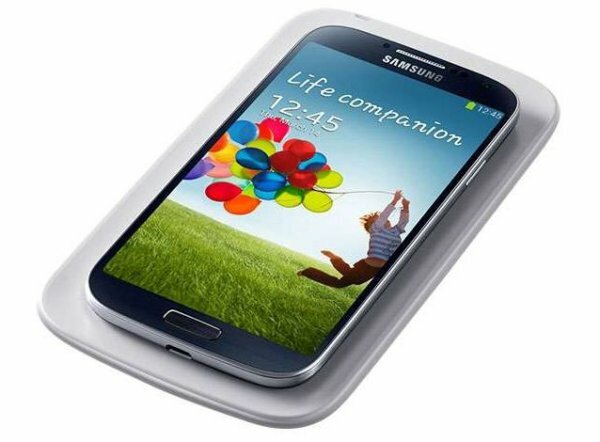 Charging pad for the Galaxy S4. It works on induction concept. Remember AC induction motors? Wireless charging mats allow you to power-up multiple gadgets all at once by simply resting them on the surface, eliminating the need for tangled wires and device-specific adaptors. They work via a process known as magnetic induction, the same method used to charge electrical toothbrushes, which employs an electromagnetic field to transfer energy between two objects. According to Faraday’s law of induction, a current is produced when a conductive substance passes through a magnetic field. So the electromagnetic force created in the mat induces a current in the device you’re charging. In future, manufacturers plan to integrate the technology into the gadgets, as well as domestic surfaces and furniture, so you can just drop your gadgets on the kitchen table and leave them to charge. For now, though, your gadgets have to be slipped into special cases that will enable wireless charging. How 'wireless' is wireless if you'd still need to plug the charging mat to the wall socket? techno dance - but it would be much convenient. You can just put 2 or 3 phones on the same charging mat and voila! No grid power, no problem! Use your urine to charge mobile phone! How close to my house can they put that?